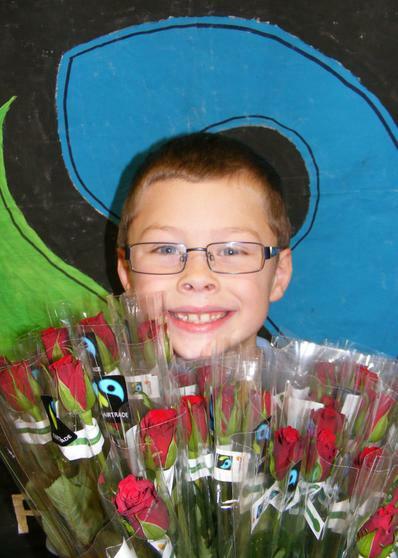 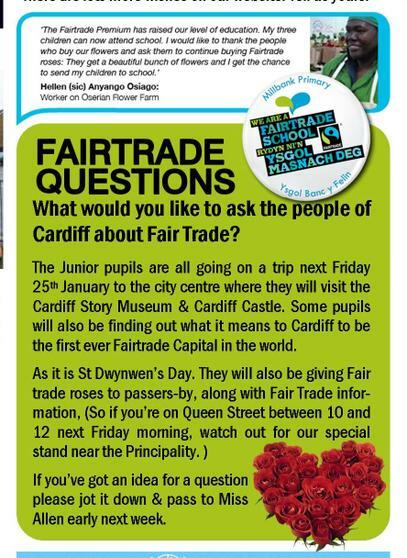 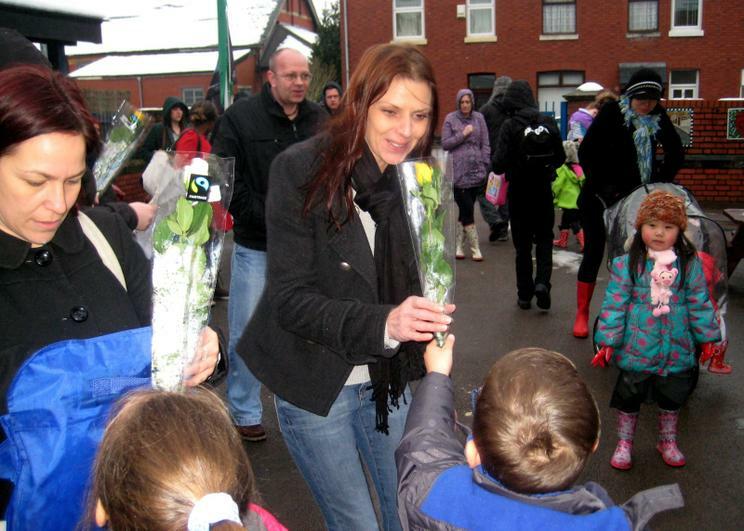 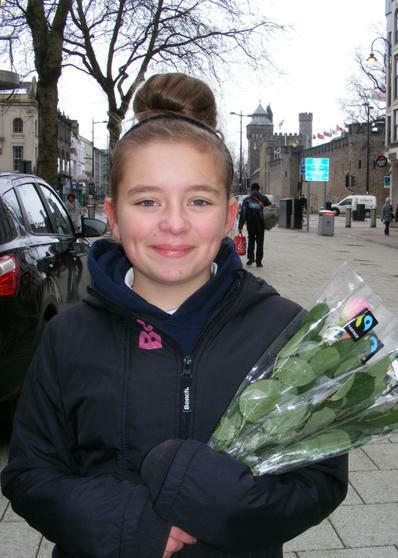 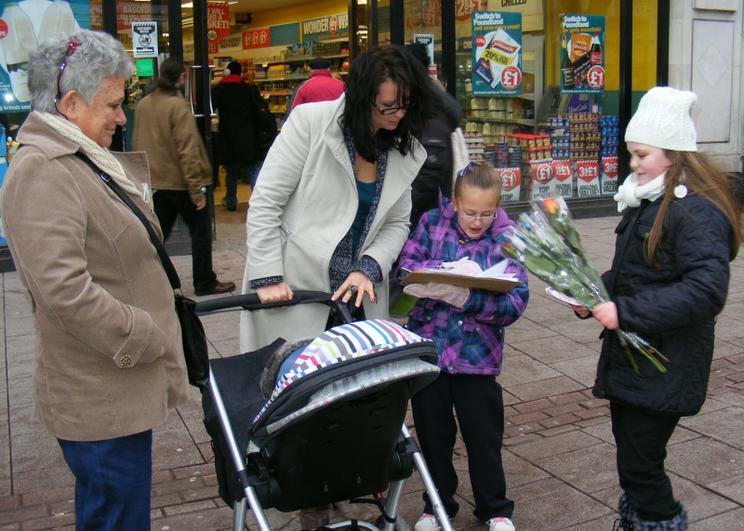 Pupils gave out Fairtrade roses in Cardiff city centreon St Dwynwen's Day, in exchange for a pledge to 'look out for the Fairtrade logo' when shopping. 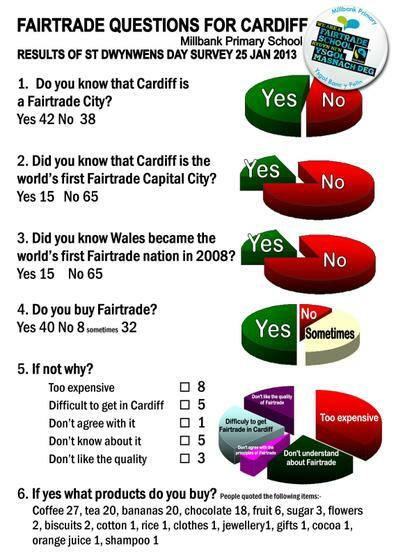 Of course Cardiff is the First Fairtrade Capital City, and Wales is the world's first Fairtrade Nation so many people we spoke to were already well aware of the values and ideas behind Fairtrade. 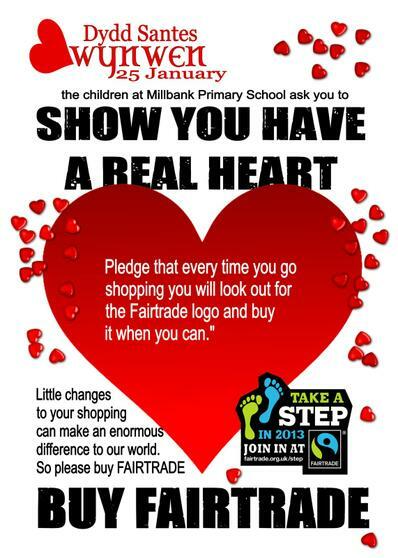 We have some great shops selling and actively promoting Fairtrade. 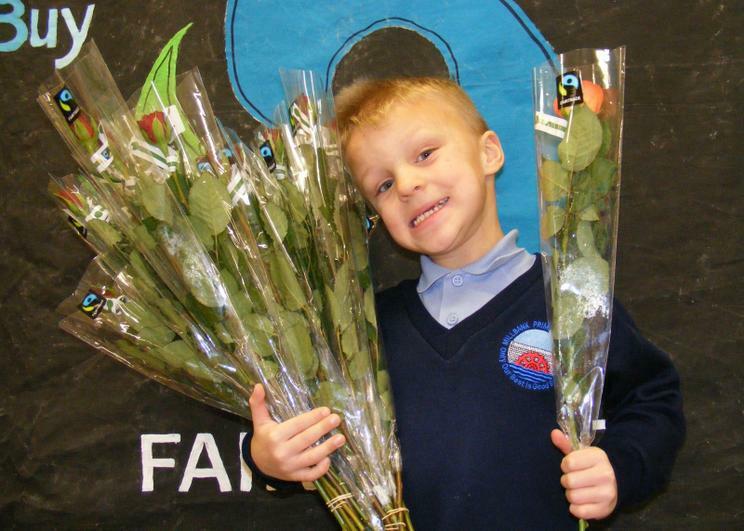 Did you know that about £22 million is spent on flowers alone in the UK on Valentines day? 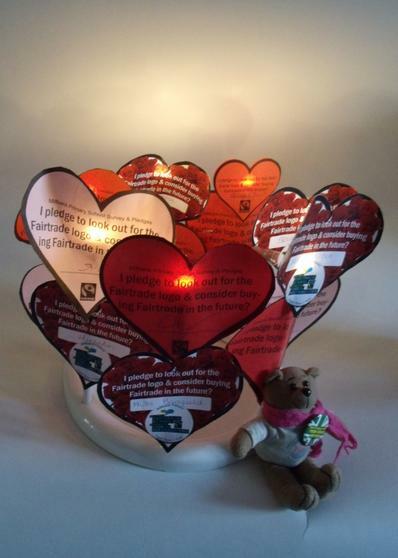 When you add in cards chocolates, wine, gifts and jewellery the total spend in the UK is around £500 million. 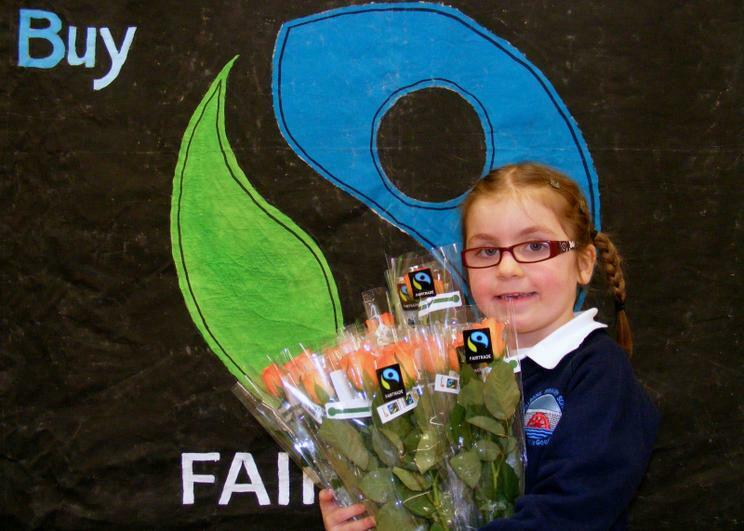 A lot of those products can be Fairtrade and the hope was that we could raise the profile of Fairtrade products now, ahead of the far larger St Valentines Day market next month. 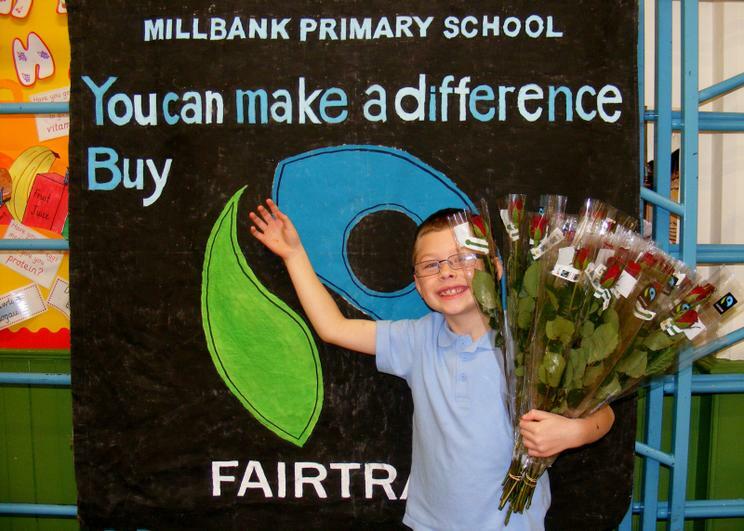 St Dwynwen is often described as a Welsh St Valentines but the day is about friendship too, so Millbank has linked it with Fairtrade for many years. 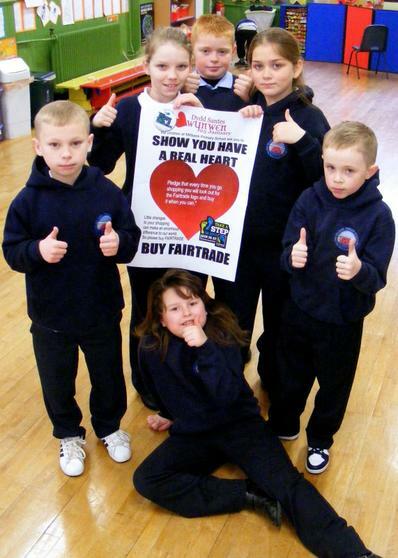 The tag line that the pupils agreed to use for the event was "SHOW YOU HAVE A REAL HEART - BUY FAIRTRADE." 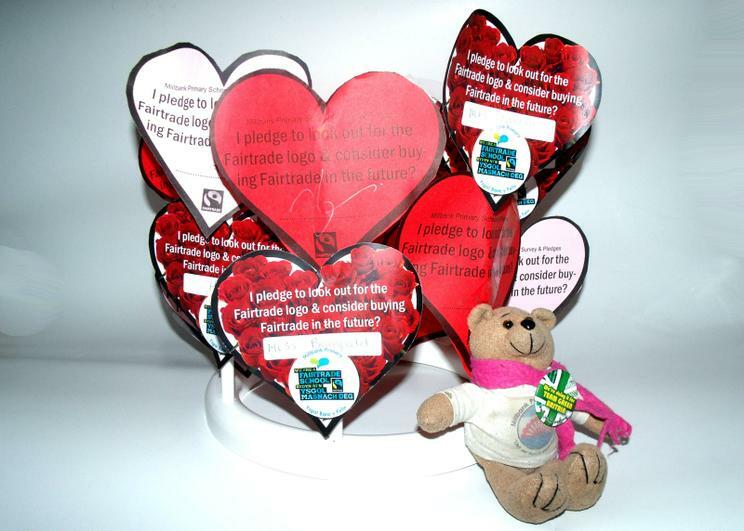 As we are so keen on recycling, we will use it again on Valentines Day, Mothers Day and every other chance we get to spread the positive message of Fairtrade. 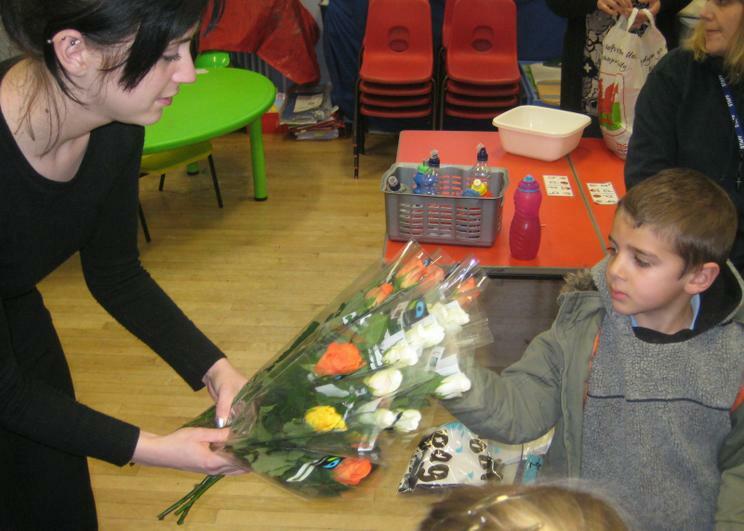 The roses were all donated by SuperFlora a brilliant Dutch company keen to support the children's work. 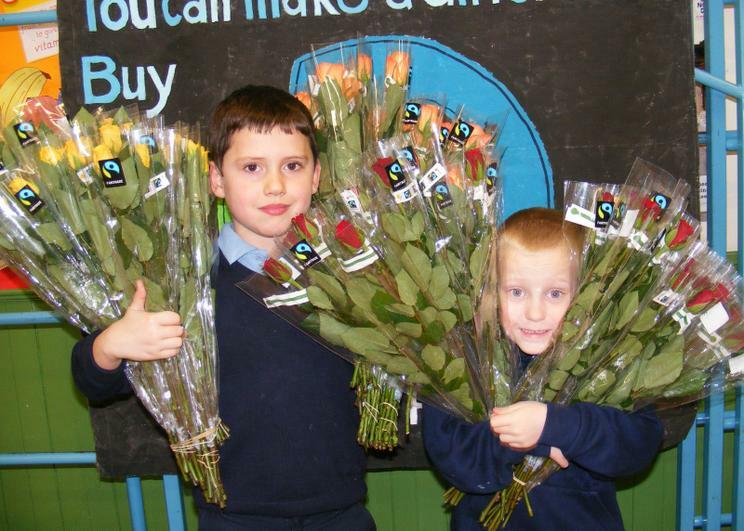 They supply a range of flowers including the Fairtrade Roses to all the major UK retailers such as Waitrose, Sainburys, Co-op. 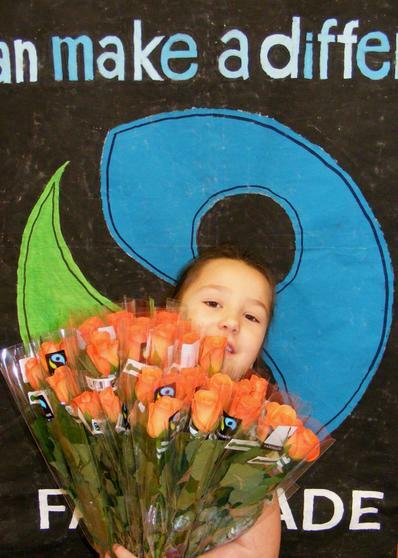 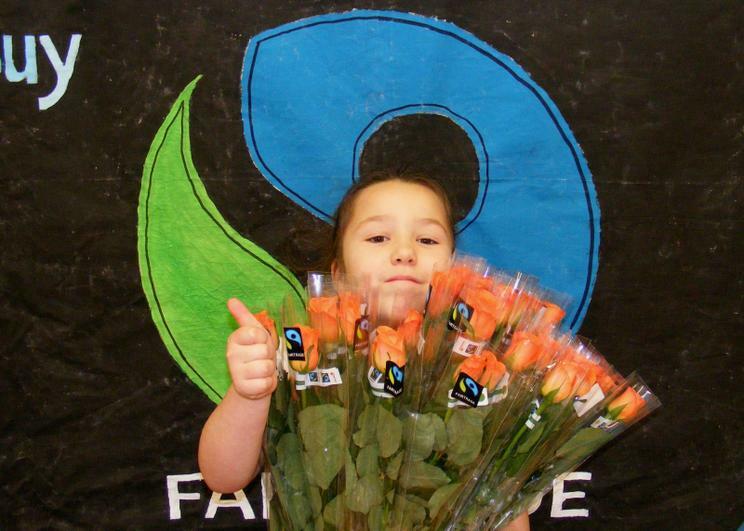 Remember if you do not see any Fairtrade flowers, tell the shop. 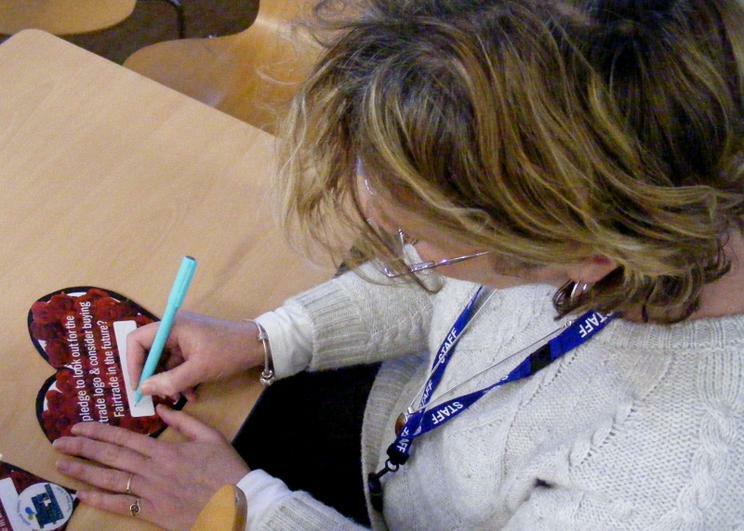 In fact do that with any product! 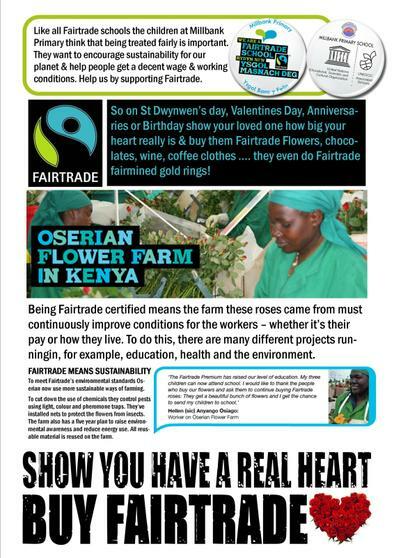 The roses themselves were grown at the Oserian Farm in Kenya. 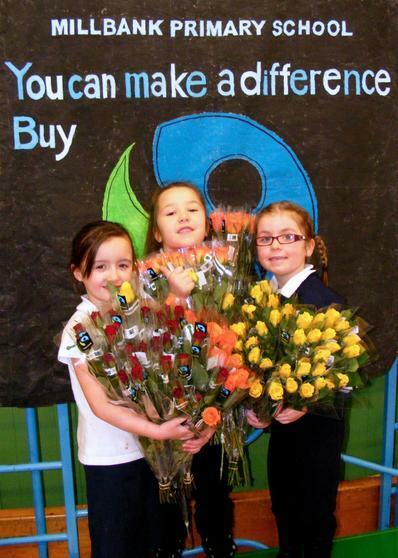 We have strong links with our partner school in Nairobi so it is great to know when we lobby the government about global education that we know we can make a practical difference ourselves every time we buy a Fairtrade flower. 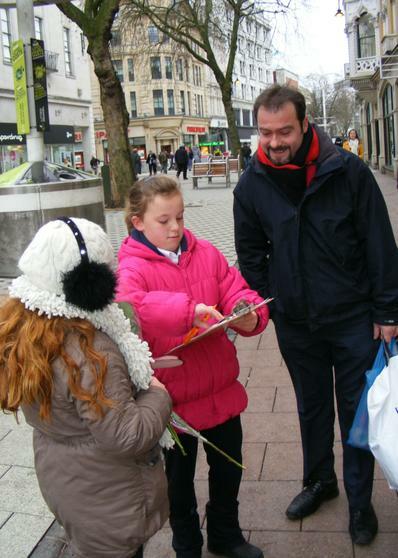 This term the juniors are studying Cardiff and what a great way to learn by organising a survey and collecting the primary data themselves. 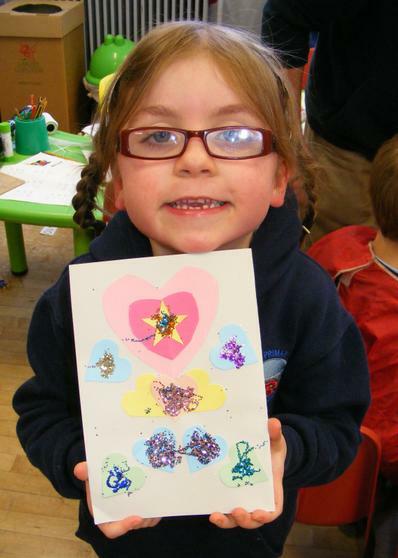 We had asked parents for ideas by using our weekly newsletters. 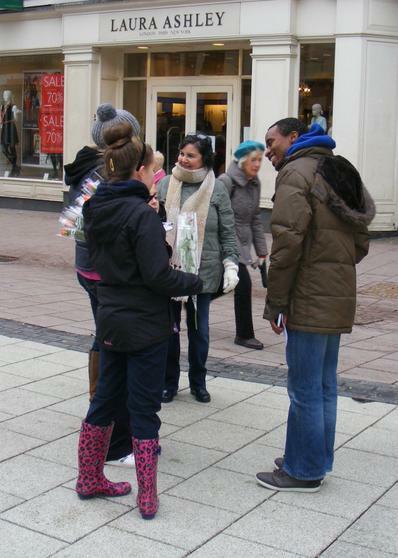 Deciding what questions to ask and then in teams going out and asking people are useful skills. 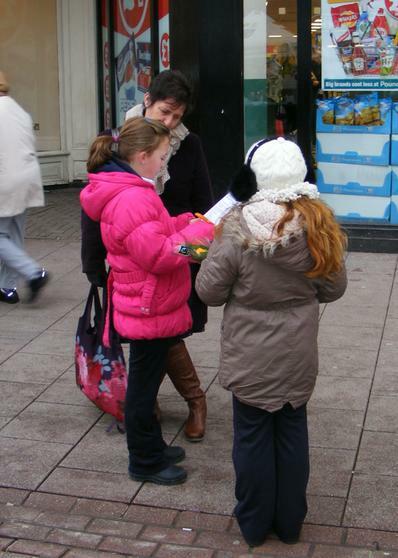 They presented the data as graphs and charts in their maths lessons. 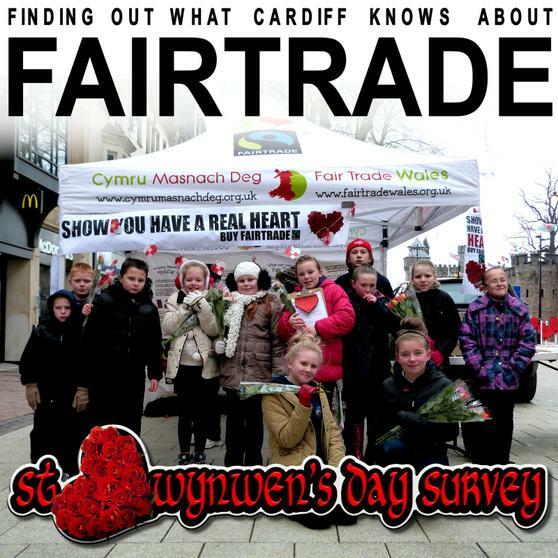 Importantly they will present their findings to the schools Fairtrade Steering Group which will decide what to focus their efforts on for Fairtrade Fortnight etc. 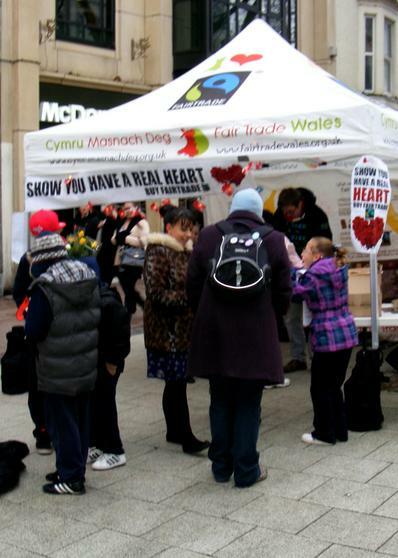 The week before the event had seen snow falling in Cardiff and whilst it had all melted, it was still a bitterly cold day. 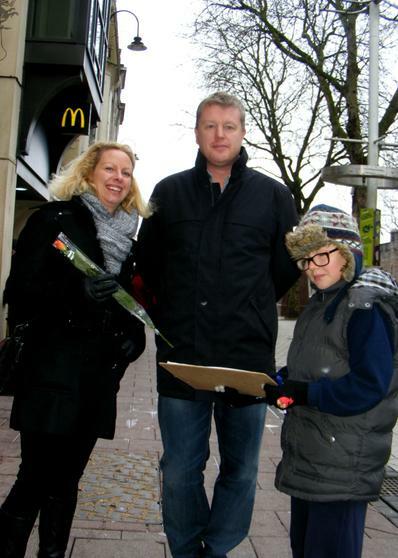 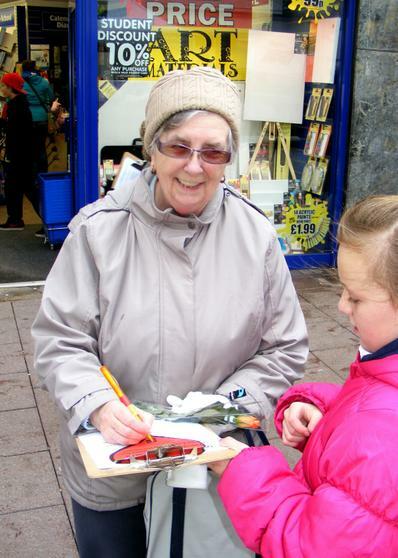 At least we managed to get the surveys and pledges done before the afternoon rain. 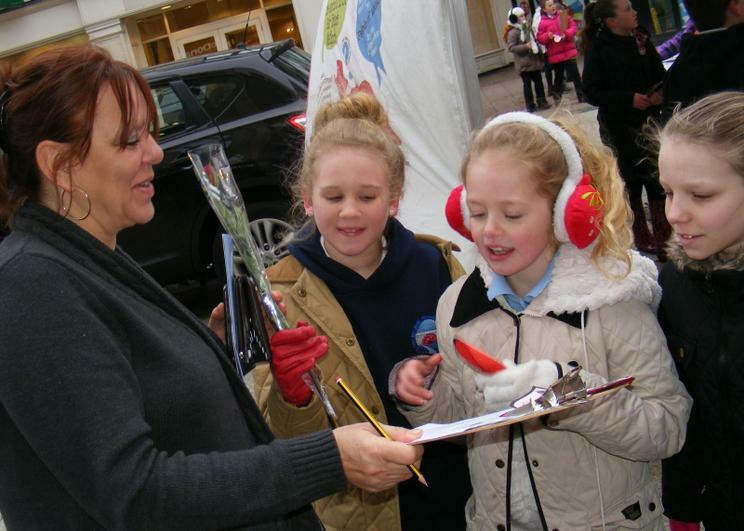 Working in pairs the children asked shoppers what they knew and if they would be prepared to sign a pledge. 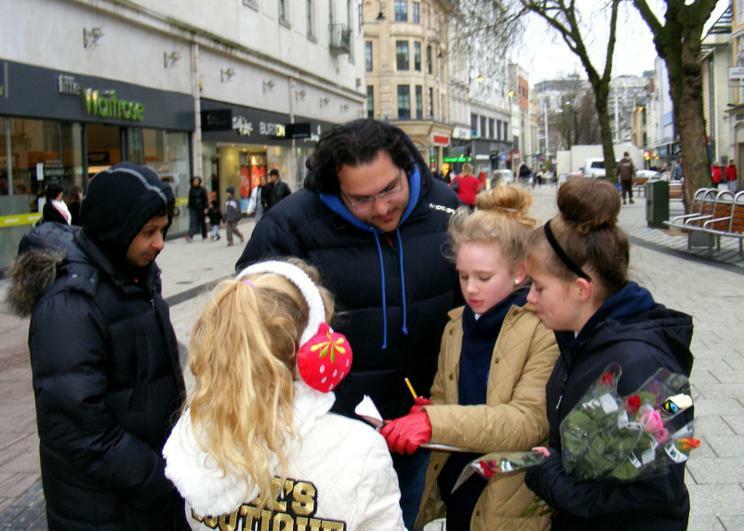 We displayed some on the table but the wind was rather fierce so they had to be securely taped down along with a lot of the posters...and some children. 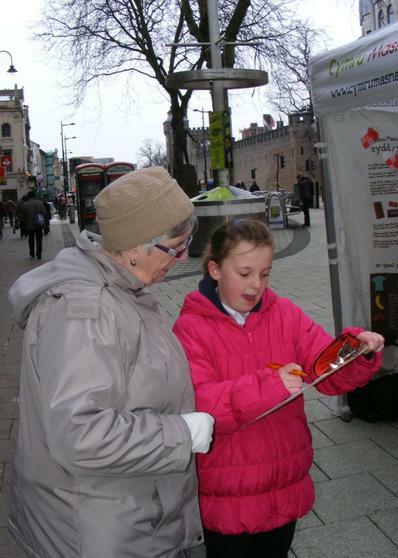 Many of the people who took part in the survey said “They are very nice polite children, it’s great to see them doing such an exciting project.” Another added “What well behaved lovely children. 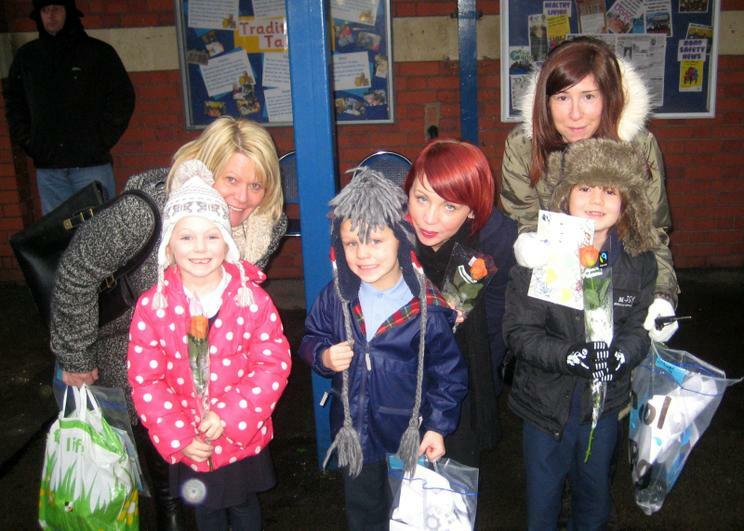 They are a credit to the school & parents!" 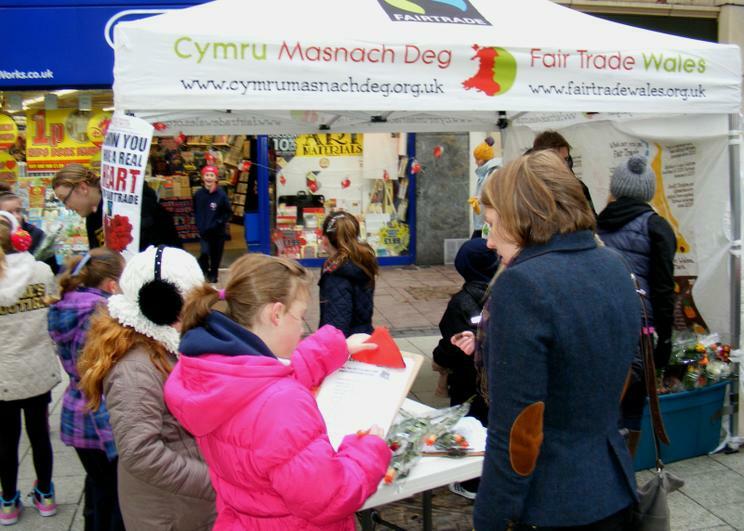 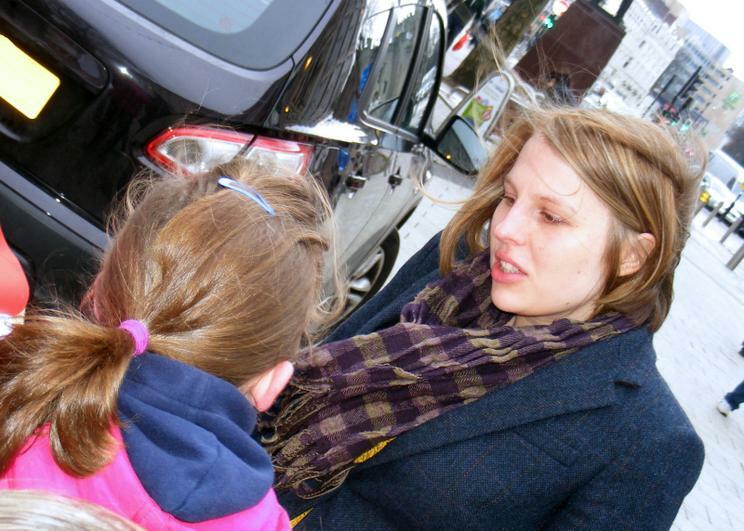 Some people told us that they did not agree with Fairtrade principles and did not want any information to learn about Fairtrade (okay it was only one -but the children were genuinely shocked!) 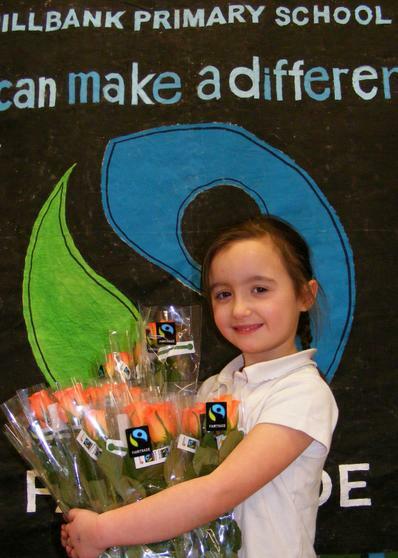 It is going to be difficult to find out what everyone like that thinks and convert them to supporting Fairtrade. 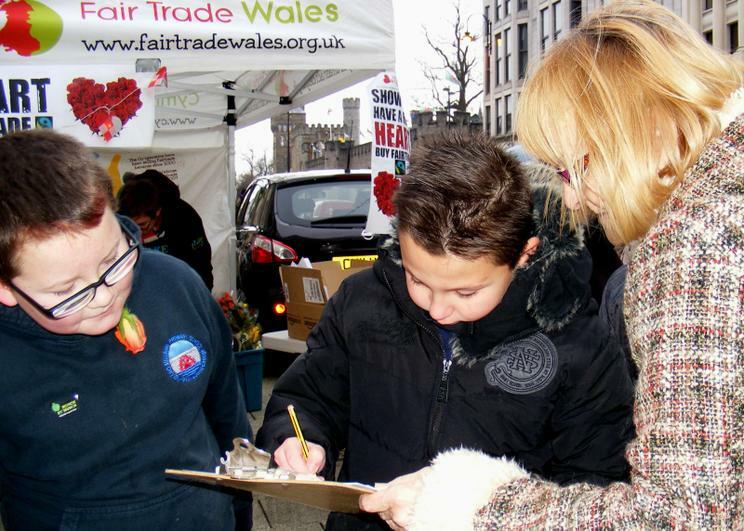 But the general feel was positive and everyone we spoke to liked Fairtrade products. 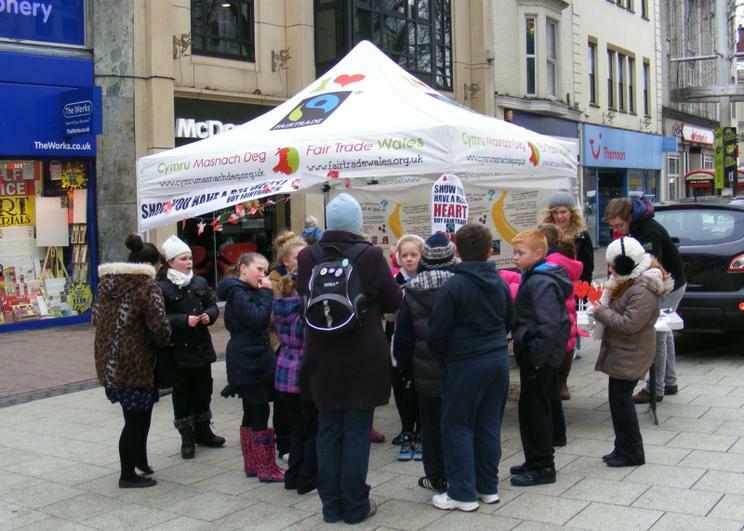 We were very lucky to have the support of Fairtrade Wales who were fantastic and helped provide a little marquee in Queen Street for us, and came along to support the children. 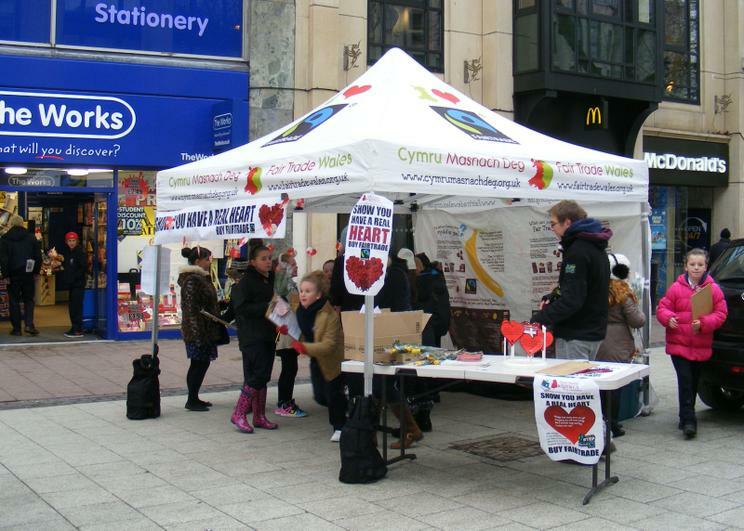 Staff at Cardiff Council were very helpful, and we need to say a big thank you to our volunteers too. 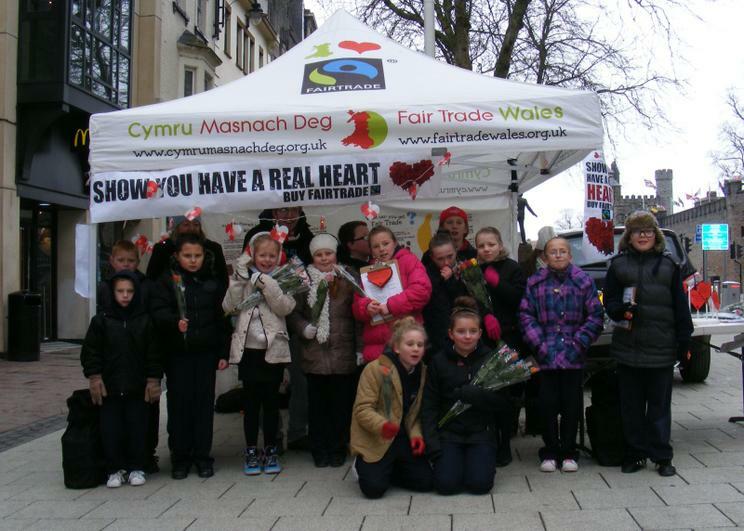 “I just wanted to email to say what a brilliant job the children did at the St. Dwynwen's Day Fairtrade marquee in town this morning. 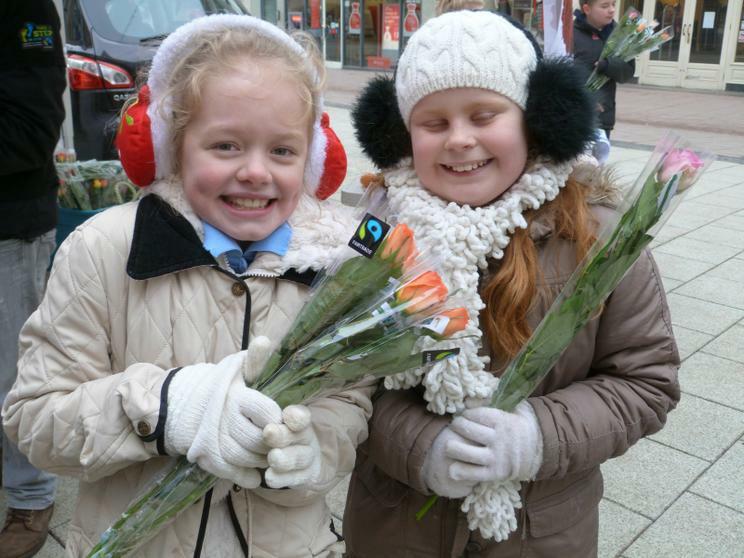 We were so impressed with how polite & hardworking they were especially given the cold. 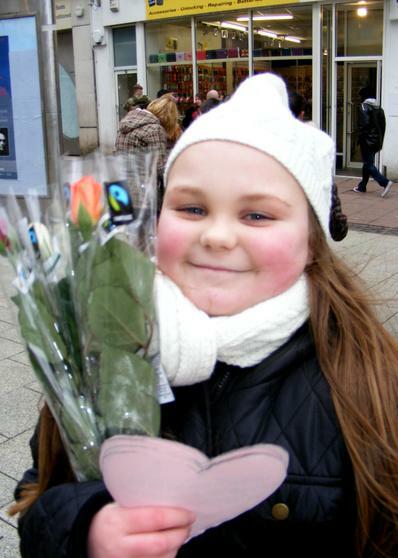 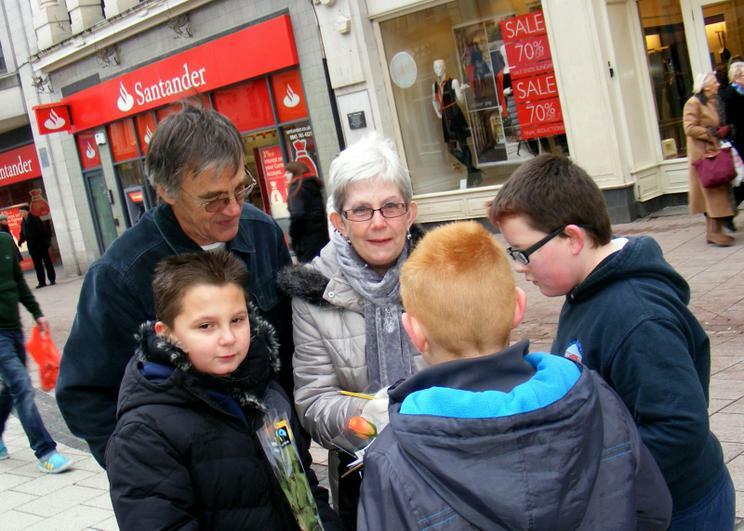 They were very knowledgeable about Fairtrade & were confident and friendly when speaking to the public and giving out the Fairtrade roses. 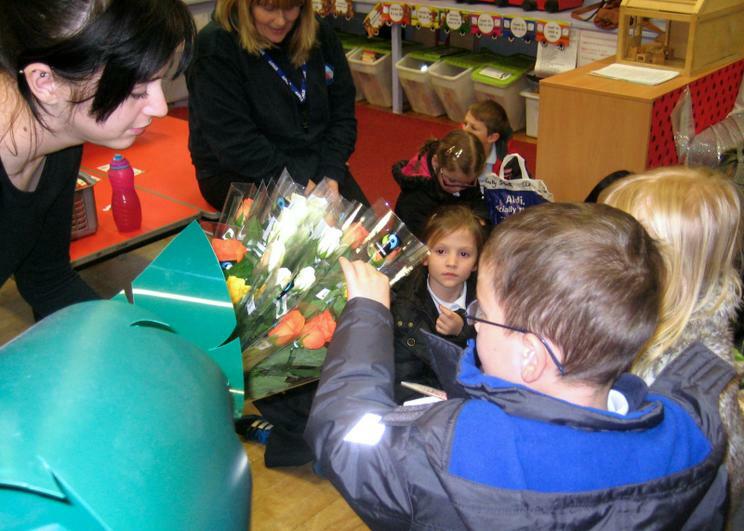 I hope they enjoyed it as we certainly loved meeting and working with them all. 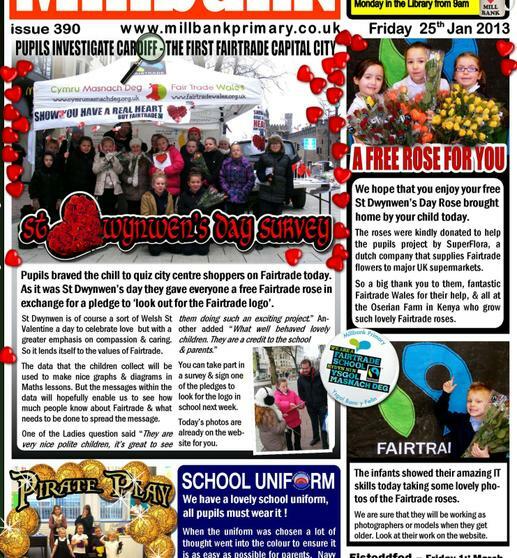 We gave out a rose to all the parents and carers on Friday with our weekly newsletter explaining where they came from and why we were doing it. 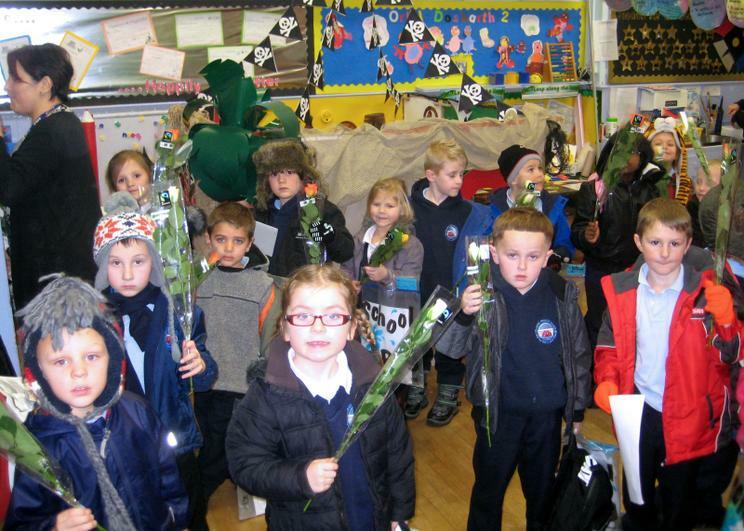 The children had of course made St Dwynwen's day cards and were so excited about choosing the perfect rose for their mums, dads and family. 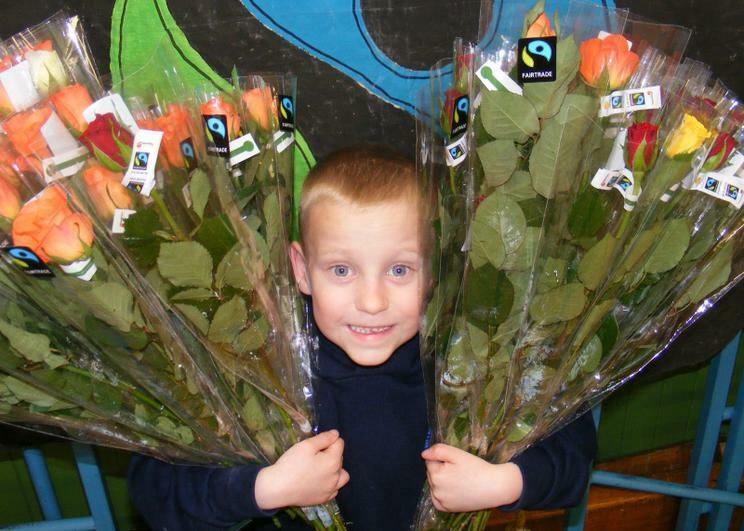 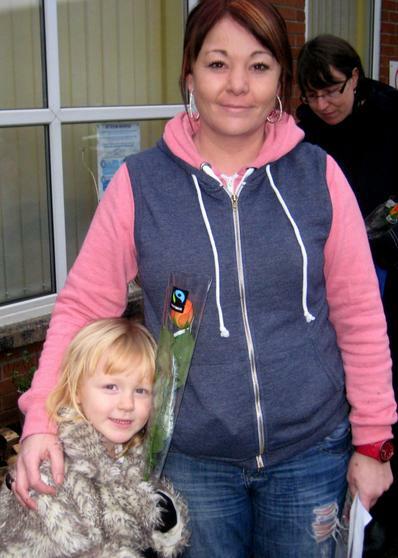 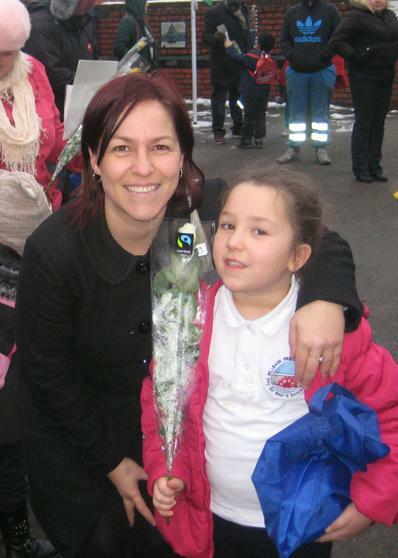 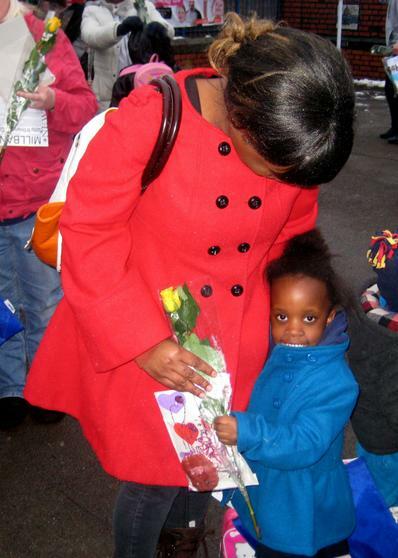 One of the infants told their mum "It's not just a lovely rose..... it's a lovely Fairtrade rose!" 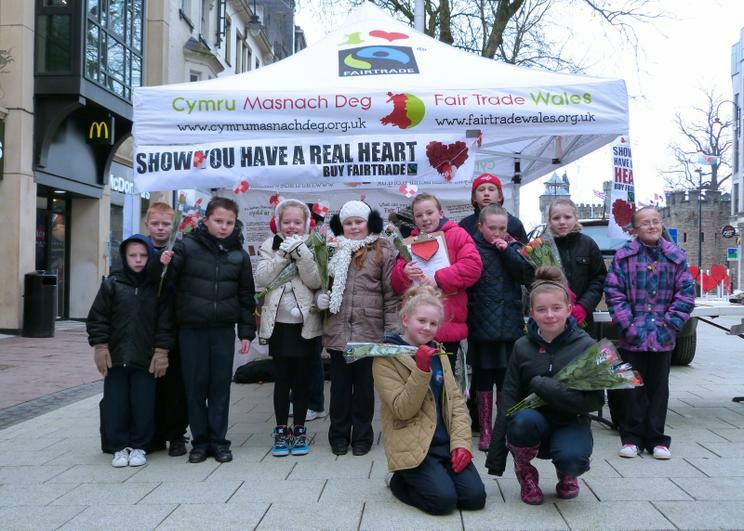 so even they seem to get the message and are spreading it to their families.We hope that you all had a Happy St Dwynwen's day and remember whatever you do whenever you do it "SHOW YOU HAVE A REAL HEART - BUY FAIRTRADE." 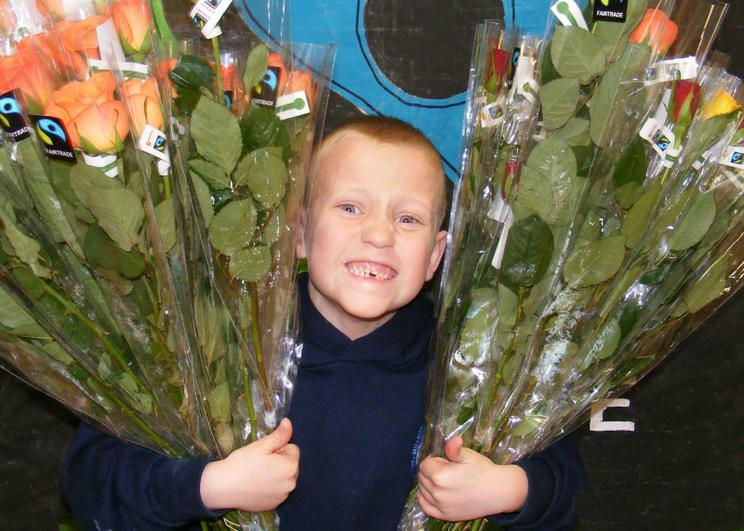 We still had some roses to give out so we popped a bucket of them into Fairdo's in Canton to give out to customers, and some went to the local Co-op store in Canton too. 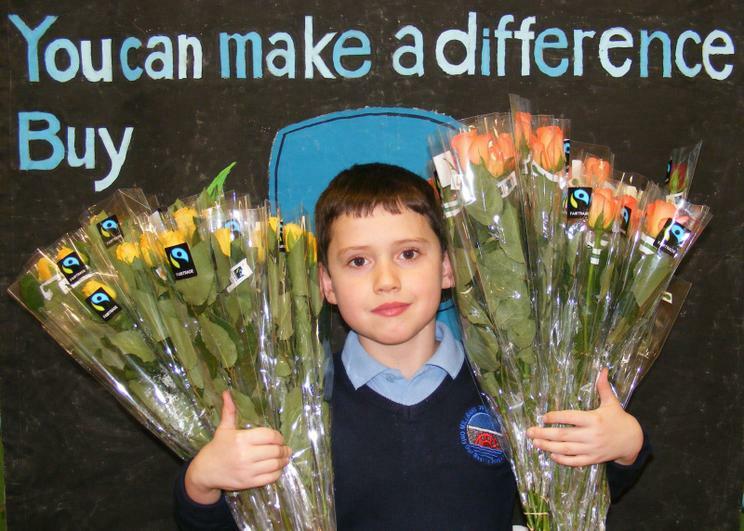 This is of course just the start of the work in promoting Fairtrade in our community. 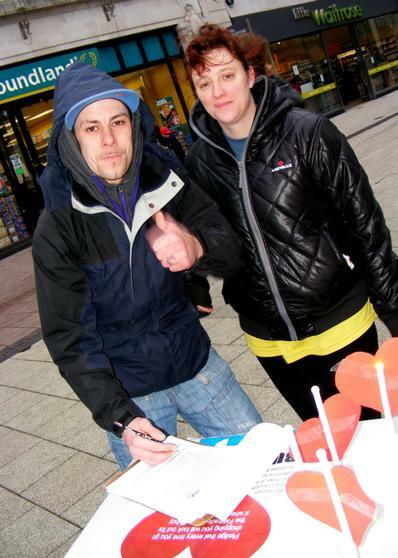 We always want to hear any ideas or suggestions about how we can do more. 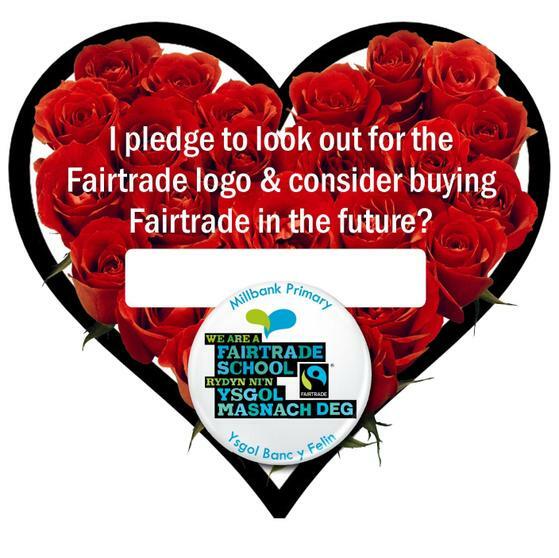 And we want to try and collect even more pledges promising to buy Fairtrade. 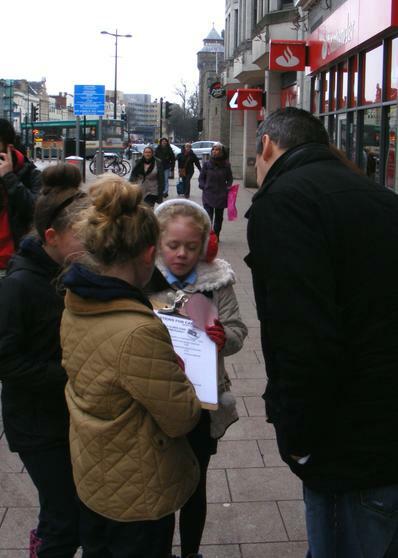 and get more survey results from the pupils. 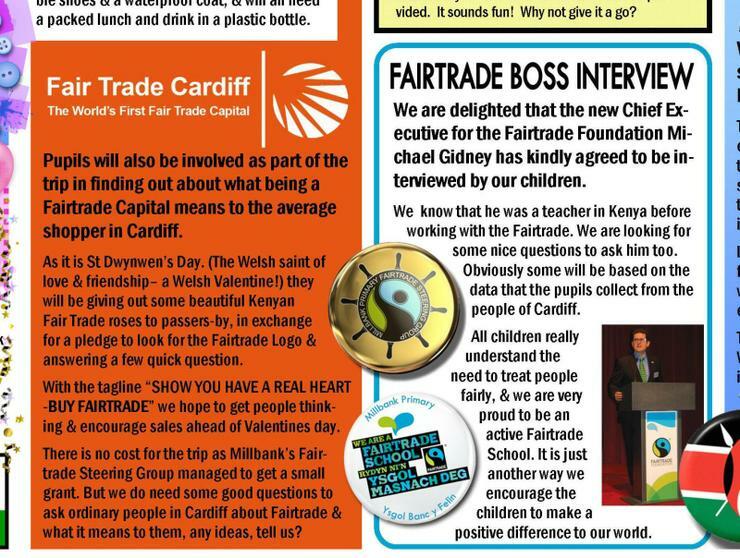 The Capital Times is the Council's newsletter and gets delivered to every home in Cardiff, they put a little story in the March edition. 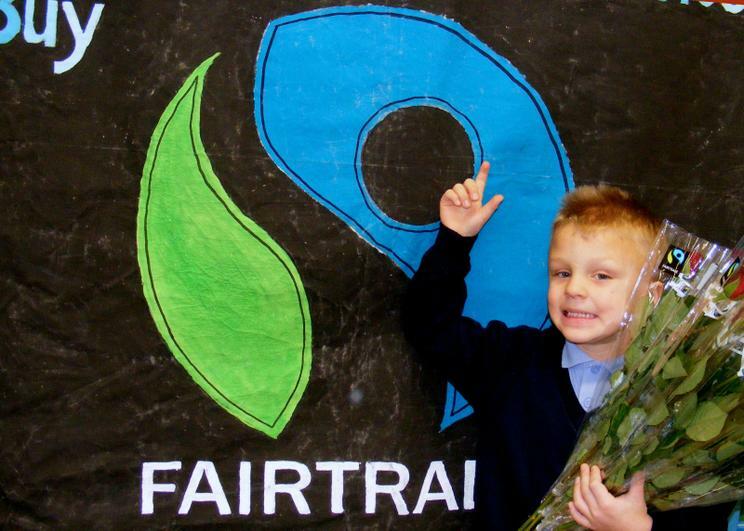 Supporting Fairtrade is something all schools do, we are extremely proud of our Fairtrade flag flying outside the school. 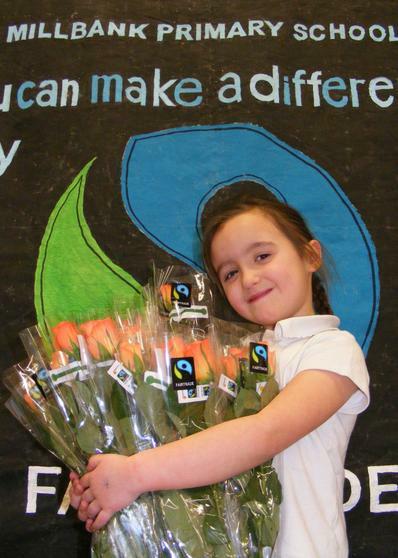 We encourage parents to buy Fairtrade Uniform its just 50p for a Fairtrade cotton polo shirt and this is a great way to chat to people about the environmental impact of buying Fairtrade and how we all benefit from that. 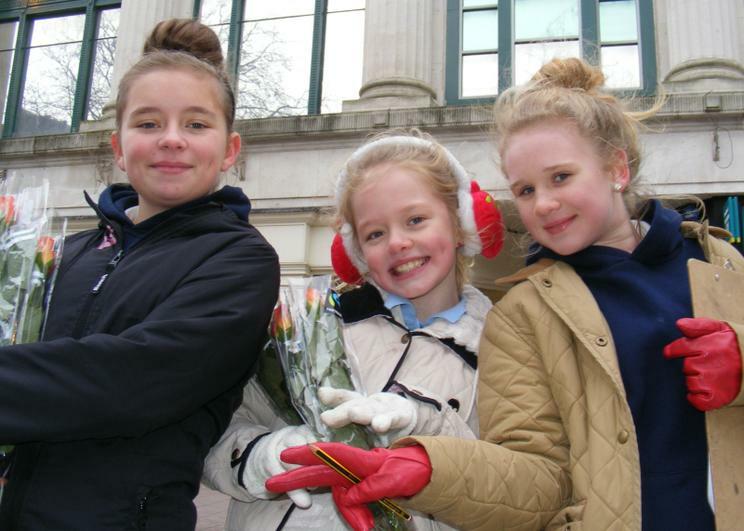 We had asked the infants to use their famous camera skills to take a few photos of the roses before they were given out. 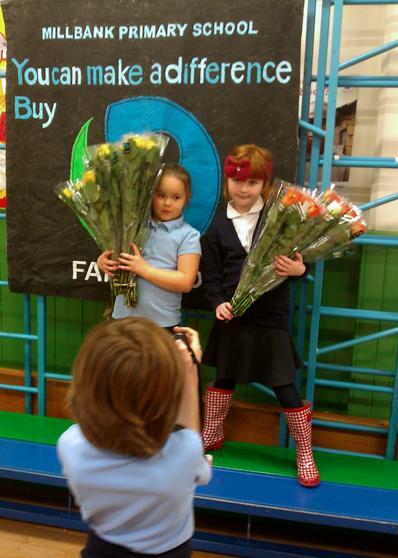 They used the banner that pupils made for Wales sustainability week in 2011 as a backdrop and tried different angles and heights to take the photos. 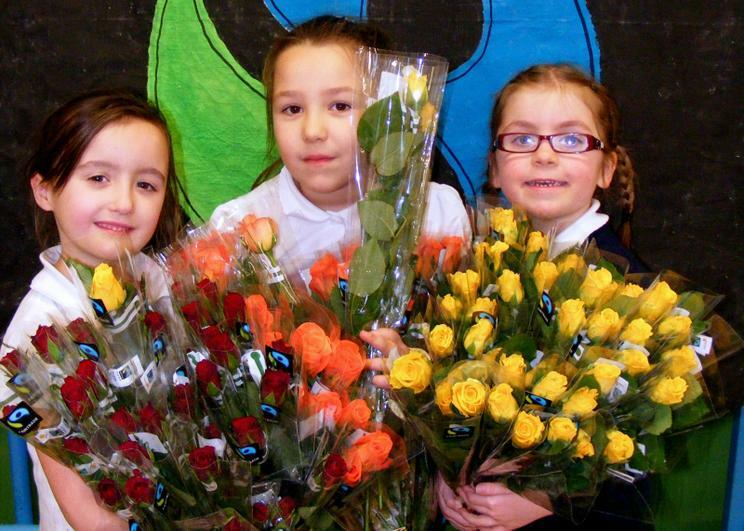 They always have a lot of fun taking it in turn to pose and take pictures using the digital camera. 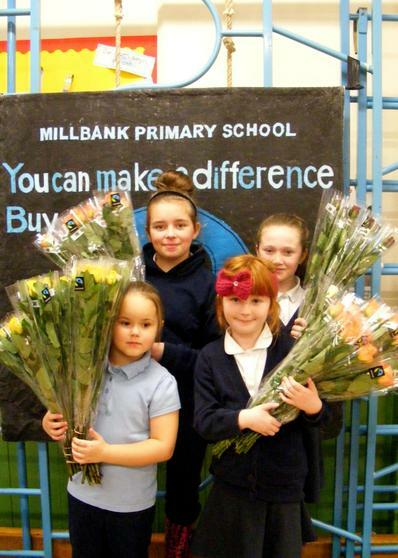 They like seeing themselves online and their work in the newsletter- well done to them!